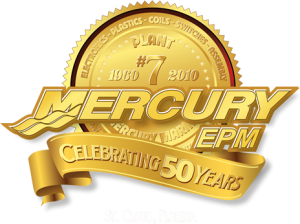 Mercury EPM is the electronics and plastics manufacturing division of Mercury Marine, the world’s leading manufacturer of recreational marine propulsion engines. Our manufacturing facility in St. Cloud, Florida was established in 1960. Designated as "Mercury Marine Plant 9," our first products were injection molded plastic engine components and aluminum pontoons. After several expansion projects and the introduction of electronics manufacturing, the plant was redesignated as "Mercury Marine Plant 7" in 1973. Since then, our facility has produced hundreds of high-performance plastic and electronic components and assemblies. Most of our products are used on Mercury Marine outboard engines, MerCruiser inboard and sterndrive marine engines, and accessories for the Mercury Marine and Quicksilver brands. In the mid 1990’s, we began producing custom products for non-Mercury customers. The name "Mercury EPM" (EPM standing for Electronics and Plastics Manufacturing) was adopted in 2009 to more accurately represent our capabilities to current and prospective customers. At Mercury EPM our operating philosophy is built on three key values: Product Quality, Customer Service and Employee Safety. To ensure we conduct our operations in accordance with these values, we maintain a dedicated staff of support personnel working on-site in the critical functional areas necessary to support our direct production departments. The Mercury EPM production facility is approximately 110,000 square feet in size. Our workforce varies in size with production requirements, with approximately 65 full-time Mercury employees augmented by 30 to 60 highly-trained staffing agency employees. Our sales total approximately $15million per year. Our corporate parent, Mercury Marine, is headquartered in Fond du Lac, Wisconsin. Mercury Marine is a division of Brunswick Corporation (NYSE: BC), which is headquartered in Lake Forest, Illinois.